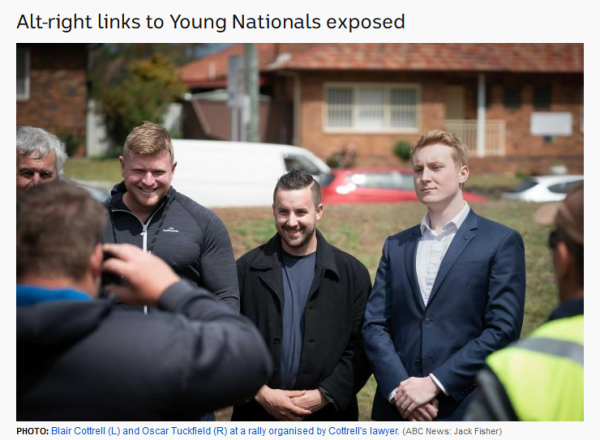 Neo-Nazi grouplet ‘The Lads Society’ — which arose from the ashes of the ‘United Patriots Front’ (UPF) and its stillborn political party ‘Fortitude’ (2015–2017) — currently operate two social centres, one in the south-east suburb of Cheltenham in Melbourne and the other in Ashfield in inner-west Sydney. The centre in Cheltenham (Unit 9/158 Chesterville Road), which opened in October 2017, is scheduled to close in January 2019. No reason has been given for the closure of the bunker in Cheltenham, but it’s worth noting that the estate agents listed the property as being available on November 7, just a few short weeks after an ABC exposé (in which Lads members starred) on neo-Nazi infiltration into the NSW branch of the Young Nationals. The centre in Ashfield also featured in the exposé. Spearheaded by the former fuehrer of short-lived neo-Nazi grouplet ‘Squadron 88’, Mark McDonald, The Lads Society centre in Ashfield is located at No.34 Thomas Street, and leased by way of the Colemon Property Group. You may remember Squadron 88 from such exciting escapades as when they stuffed letterboxes in Bondi with anti-Semitic tracts in August 2014. And again in September 2014. Or, when they briefly adopted geriatric neo-Nazi Ross ‘The Skull’ May as the group’s mascot. Above (L to R) : John Bolton (Cottrell’s lawyer/ex-Australian Liberty Alliance), Blair Cottrell (UPF/Lads), Mark McDonald (Squadron 88/Lads), Oscar Tuckfield (Young Nationals/Lads). In response to the establishment of The Lads in Cheltenham, a local group formed, ‘South East Community Action’, to campaign to close the neo-Nazi organising space. Now, in response to the establishment of The Lads Society in Ashfield, another campaigning group has formed: ‘Ashfield Community Action’ (Facebook /// Twitter). To keep abreast of its progress, please like/share/follow their social media. • Ashfield was the site of a previous neo-Nazi infestation in the 1960s. • The Lads have been making noises about setting up shop in both Adelaide and Brisbane. Something of the flavour of the group’s membership was given when two were chucked out of a bar in Brisbane for throwing up Nazi salutes. This entry was posted in Anti-fascism, Broken Windows, History, State / Politics, Student movement, That's Capitalism!, War on Terror and tagged 34 Thomas Street, 34 Thomas Street Ashfield, Antipodean Resistance, Ashfield Community Action, Australian Liberty Alliance, Beau Maverick, Blair Cottrell, Clifford Jennings, Colemon Property Group, Firearm Owners United, James Buckle, John Bolton, Kingsley James Taylor, Lads Society, Mark McDonald, NSW Young Nationals, South East Anti-Racists, South East Community Action, Squadron 88, The Lads Society, Thomas Sewell, Tom Sewell, Tyler Winchester, Unit 9/158 Chesterville Road, Unit 9/158 Chesterville Road Cheltenham, United Patriots Front, Young Nationals. Bookmark the permalink. 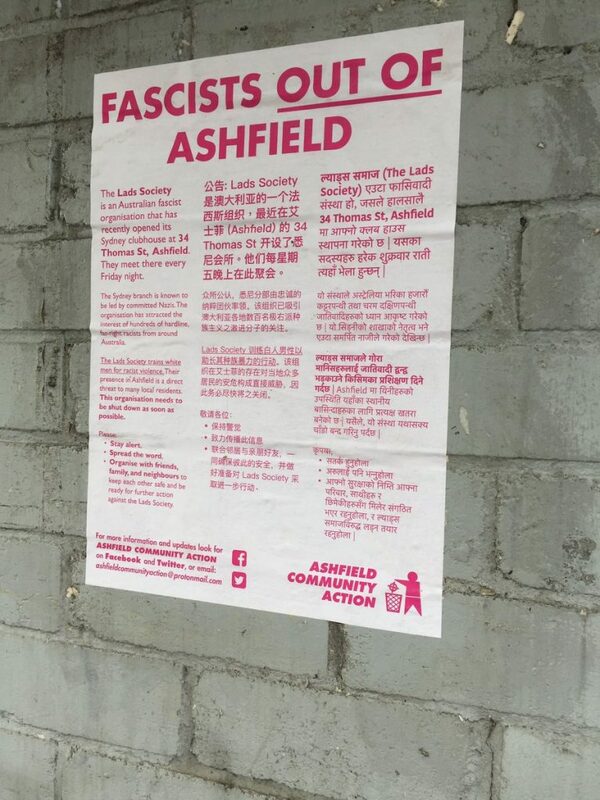 1 Response to Neo-Nazi group ‘The Lads Society’ @ 34 Thomas Street, Ashfield, Sydney : Help shut it down!